“Because free will” has to be one of the most oft-quoted phrases uttered over and over by apologists or defenders of belief. It’s used as a cure all for any critical talk of gods or holy texts. What everyone needs to understand is that the knowledge of a god being real wouldn’t stop someone from being able to choose to follow it or not. If a god revealed itself to the world, we would still be free to reject it’s authority, divinity, or rule. I wouldn’t automatically be subjugated to it’s leadership. Having knowledge that a god exists wouldn’t in any way force me to worship it. If anything, it would most help me make an informed choice because you know, there’s thousands of gods to choose from. Demons, according to the bible, believe in god and reject him. They’ve seen god with their own ethereal eyes and still reject him. Could humans not possess the same ability? So I ask, what would your god have to lose by revealing itself? There are currently 2.18 billion Christians on a planet holding 6.9 billion people. That means that at least 4.72 billion people are going to hell at this rate. Wouldn’t god making itself known stand to potentially save billions more from hell, the very place it desires strongly to save us from? One friend berated me when I was very early in my doubting phase when I asked that question. “How dare you be so selfish, Nate. How dare you ask questions of god like that.” I didn’t think it was too much to ask. If anything, I thought it was more compassionate and loving to make itself known. If the end result is hell, why wouldn’t a loving god help more? It’s then that I remember that the loving god made hell, or allowed it’s creation, and it’s that same god that created the rules for us to go there, so it’s probably not that loving to begin with. So please, stop yelling “FREE WILL” anytime you’re backed into a corner. A god that made it’s existence known to the world in a tangible way could still be rejected, but at least all doubt would be removed from the situation. Now if we could only get Bigfoot to reveal himself in something other than blurry pictures and shaky camera footage….. This entry was posted in Agnosticism, Atheism, Christianity, fundamentalism, Religion, theism, unbelief, Uncategorized and tagged apologetics, Belief, bible, choice, demons, faith, free will, knowledge by Nate Pratt. Bookmark the permalink. What everyone needs to understand is that the knowledge of a god being real wouldn’t stop someone from being able to choose to follow it or not. If a god revealed itself to the world, we would still be free to reject it’s authority, divinity, or rule. Precisely. It is also implied that evil is a necessary component of free will. Evil isn’t necessary for love of God or lack thereof to exist. Actually, those are better than anything we’ve yet to get on god. I know he is! It’s the Abigfootist that is closed minded to the authorship of said blurry photos! If people would open their hearts to Bigfoot, they would see he’s real just like you and me! They have no objectivity and should not be allowed to hold public office! I’ve always loved that quote. Thanks for the reminder of it! Psssst. Freewill. Riiiiight. Technically Nate, we don’t have any freewill because “god” already has all of our lives planned out, even prior to our birth. If it’s all preplanned, where the heck is our freewill? So what happens when a non-believer eventually sees “god” when he dies?Can he say ” Hey, God, you really do exist. I wish you’d have given me a sign, so I could have believed in you. But hey, since I know you are real, and I have freewill, can I use my freewill go to heaven now?” Of course not! So I guess we really don’t have freewill. Off the subject a tad, I’ve always wondered why if “god” is omniscient i.e. he knows everything and knows what will happen to us before we are born, what is the sense of making non-believers like you an I, just to have us sent to Hell and tortured for eternity? It seems like a waste of time and rather sadistic to me. I’ll never yell FREEWILL, heck, I wont even yell Freebird! The fact that none of these folks can give a meaningful or useful definition of free will pretty much kills the discussion for me. Yet you’ve ironically chosen of your own free will to leave a message saying how not into the discussion you are about free will. This entertains me. Thanks for stopping by. Hope you will do so more in the future! 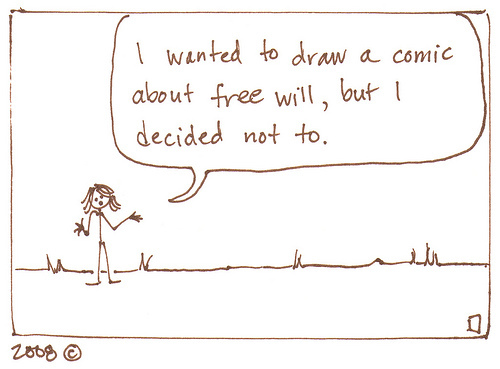 Still no idea what you mean by free will. Great post! Excellent point about demons. Yes, the “Divine Hiddenness of God” argument is easily and thoroughly debunked. In a scenario in which we are totally, 100% convinced of the biblegod’s existence, we are most certainly free to reject the love, the offer to worship, the substitutionary atonement, and all of the policies of said god. But it gets better, because there’s even biblically-supported evidence that “free will” is a crock. When we expire, presumably “every knee will bow” and “every tongue will confess” that he is “LORD”, which kind of flies in the face of “free will”, doesn’t it? ‘Just one more reason the “free will!” argument flops…….biblegod is going to MAKE us worship him anyway!